Italian graphic designer Stefano Giurin has designed some new eye-catching go-themed t-shirts, sweatshirts and bags. 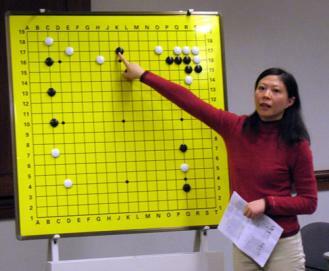 A self-described “go addict,” Giurin, a 12-kyu, started playing a year ago. “I’m trying to make go more cool for everyone, not only for players,” Giurin tells the E-Journal. The American Go Foundation is conducting its annual fundraising appeal, asking players who love go to support the growth of the game. “We’re doing more than ever to bring in a new generation of players,” says AGF President Terry Benson, “and we’re doing it with generous donations from American players, not with foundation or government help. The AGF is a 501(c)3 charity, so US donors can deduct their contribution from their taxes.” The AGF has many new offerings, Benson explained. “This fall we added the newsletter for teachers, a Teacher Store, a lesson plan cooperative for teachers , more types of teaching equipment, and we are working on a college scholarship program,” Benson said. “We can now accept credit card payments and donations. In today’s financial climate, we need all the help we can get. Even small amounts matter. Whether someone contributes to the AGF General Fund, to help go education and outreach like the tigersmouth.org website, or to the Summer Go Camp Scholarship Fund, they’ll join hundreds of others who make AGF work possible .” To contribute, download this form and fax with your credit card info or mail with a check. 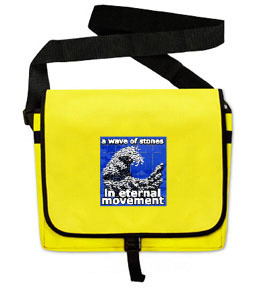 See the AGF’s appeal ongodiscussions.com for more information about AGF programs. Benjamin Teuber 6D (l) won the Nikolaus tournament in Brauschweig, Germany on December 6-7, with 38 players participating. Lin Hai 4D took 2nd and Stefan Katschick 5D won third place. Stephan Thober 1D of Greifswald won the Mecklenburg-Vorpommeren state championship on November 21-22. Volkmar Liebscher 3D was 2nd and Martin Schidt 1D was 3rd. Franz-Josef Dickhut 6D won the Japanese Consul-General’s Cup, also held November 21-22. At stake was a ticket to Japan, and Dickhut told the EJ that “My wife is from Korea, so we go there almost every year. But I’ve only been to Japan a few times, representing Germany in the WAGC.” Christoph Gerlach 6d won the ‘Blitzmeister’ title December 13-14 when the final four contestants met in a marathon in which they played each other six times. Utrecht’s Team 1 won the top Fall league in Holland and Utrecht’s Michiel Tel 1k won the prize for best progress in the top league with 44 points. Leyden had tied in matches and games, but lost the Leyden- Utrecht match. The top teams from Eindhoven won both the 1st and 2nd leagues; Eindhoven 1 won all five matches, finishing ahead of Utrecht 2 (4-11) and 3 (2-7). Eindhoven 2 won the second league 4-11, where Ivo Creusen gained 72 points, making him overall Best Progress winner. Finally, Almere 2 won 3rd league 5-13, with Huib Olij winning Best Progress. A total of 72 players participated. After three rounds in Germany’s Autumn Leagues – in which 72 teams are playing — only three teams in the top league are still undefeated: Karlsruhe didn’t drop a single game, Dragons from Frankfurt am Main won all matches but lost two games and HH-Hebsacker, the Go publishing house from Hamburg is third. The differences between go leagues in Holland and Germany are interesting and may be instructive for go organizers elsewhere. The Dutch leagues have small teams and meet in person, while the German league teams are larger and meet almost exclusively online. 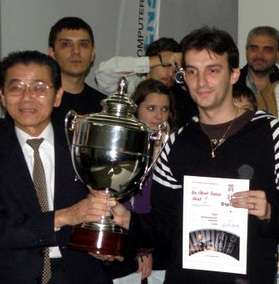 Cornel Burzo 6D won the Romanian Ambassador of Japan Go Cup held December 13-14 in Bucharest. Lucian Corlan 5D took 2nd place and Daniel Cioata 5D was 3rd in the second edition of the event in which 150 Romanian Go players from 6 to 60 years old played. The event was also the occasion for the launch of Pro-G0, the new Romanian electronic go publication by Dorin Chis. Kong Jie (l) 7P will face titleholder Lee Sedol 9P in theSamsung Cup finals. The best-of-three-games semi-finals of the international Cup featured one Korean, Lee Sedol 9P, and three Chinese representatives, Huang Yizhong 7P, Kong Jie 7P, and Zhou Ruiyang 5P, the only teen in the group. Lee kept Korea’s hopes alive by defeating Huang 2-0 and Kong got the privilege of facing Lee in the finals by defeating Zhou 2-0. 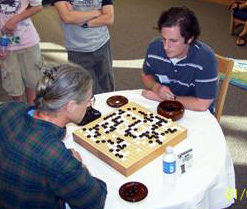 Both players won their first semi-final game by a mere half point, and Kong took the second by only 1.5 points. Lee won this event last year, as well as in 2004, and currently holds three international titles. Kong’s most notable achievement is winning the national Chang-ki Cup twice, in 2005 and 2007. Overall, the Japanese and Chinese have won the Samsung twice, and the Koreans the other eight times. The finals are set for mid-January. Lee Changho 9P (r) and Chang Hao 9P will meet in a best-of-three finals of the 7th international Chunlan Cup. In the semifinals on December 11th Lee Changho 9P of Korea defeated Kong Jie 7P while Chang Hao 9P defeated Zhou Heyang 9P. Chang came in second last year, losing to fellow countryman Gu Li 9P, which is the only time the Chinese have won this event. Lee has won it twice, in 2003 and 2005. Overall, Koreans have won it four times and the Chinese and Japanese once each. The winner’s purse is about $150,000 US. 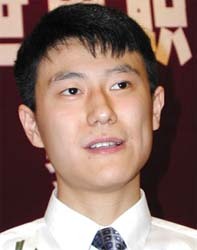 Lee is also the only Korean ever to take second place, in the first Chunlan in 1999 when he lost to his teacher Cho Hunhyun 9P.